Dez meets Kale when he literally lands at her feet as she makes her way home from a party. Realising her dad will be home soon she thinks bringing Kale home with her will be the perfect way to annoy him but what she doesn't expect is that the two of them already know each other. It quickly becomes clear that her father is hiding something and he isn't quite the lawyer he has always pretended to be. As Dez gets to know Kale and finds out more about his abilities and the group of "sixes" he grew up with she starts to realise just how dangerous her father's organisation Denazen is. As Dez risks it all to help Kale escape can the pair of them help rescue the other sixes who are caught in Denazen's clutches? 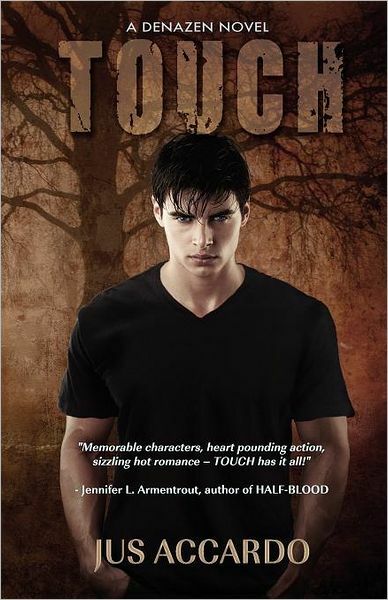 I had seen so many fantastic reviews for Touch that I had high expectations when I picked up my Kindle to start reading it. Unfortunately while I enjoyed the story it didn't wow me as much as I hoped it would. I do think the series has potential though and as this is Jus Accardo's debut novel I'll definitely be trying at least the next book to see how things progress. Our main character Dez is a seventeen year old girl with a serious grudge against the father who has always been so distant with her. It is Dez's main goal in life to upset her father as much as possible which makes her come across as quite obnoxious when you don't really see the full picture of why she is so mad at him until later on in the book. As the story continues you start to see how her dad treats her and her behaviour becomes more understandable but I still felt that she was too quick to believe what other people told her about him and the organisation he works for. After all a lot of teenagers argue with their parents (I know I did!) but that doesn't mean they'd be so quick to believe that they are capable of murder! For someone who can be so smart one minute Dez is also incredibly naive and trusting the next and she never seemed to question anything that people told her taking even complete strangers at their word. "Alex used to tell me he'd sneak in and watch me sleep. I always knew he was there, though, and feigned sleep, loving the idea of his eyes on me. It gave me a thrill to know he was watching. Occasionally I'd let my bare leg slide from under the blanket, visible all the way to just below the danger zone." So not only is Dez's reaction to being stalked by her boyfriend excitement she also practically does a strip tease for him while pretending to still be asleep. To make matters even worse this memory is shared with us because Kale (a guy she has known less than two days at this point) has sneaked into her room through her bedroom window and her reaction to his appearance is to push off the blankets and pull the edge of her top up. I would really love to see a heroine in these circumstances to sit up and start screaming for help or at the very least tell her stalker to get the hell out of her room and then proceed to kick his backside on the way out! If I put aside my reservations about Dez and her behaviour then I am really interested in the idea of the sixes and their abilities. The story definitely has an X-Men feel to it and there is a lot of potential for where the series could go. I think if more time is spent on showing Dez's friends powers and the characters are developed further I should enjoy the next instalment even more.